A lot of tourists and visitors who come to visit the place dream about a perfect stay surrounded by many villas fringed beautifully with palms, with a decent service like the 5-hour massages worth every buck for example. If so, then choose to stay at Kiri Boutique Hotel where all Khmer traditions are blended delicately with the up-to-date amenities. Find it only one kilometer away from the popular Old Market and Pub Street. By getting inside for the first time, it makes you feel like being at home. The first impression of this hotel is how great it is for you to stay, not to mention how super comfortable and spacious each room here might feel. The staffs from the place can speak English fluently to make it easier to adapt yourself to the environment here. However, the problem you must face when staying here is how frustrating it is to walk a little bit far from here to arrive at the Pub Street and other night markets. To make up for this, the whole atmosphere feels quiet and calm. 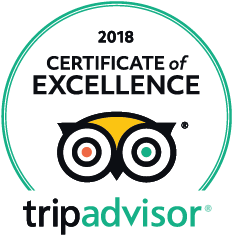 The hotel finds it much easy to make people “wow” with not just its swimming pool, health club but also a professional management team to maintain all staff on their toes. At first sight, the hotel appears to own a resort style, so no wonder why you could find it both elegant and soothing to stay here for entertainment or business. Locals usually call it as the Gold Banana Hotel, and it’s quite popular with travelers who come with their families. Each room here is extremely immaculate, bright an airy at the same time. The whole decor is so attractive, especially the tiling here — it’s decent and exquisite! Speaking of the accommodations here, they’re mainly centered around by a highly modern and spacious swimming pool. There are always cable TV and DVD players equipped in every room here, especially the WiFi that is available throughout the place most of the time. Therefore, you can freely enjoy watching the movies with cable channels and go online whenever you want. If you feel hungry, go dining with the room service or get to the minibars for some refreshments. 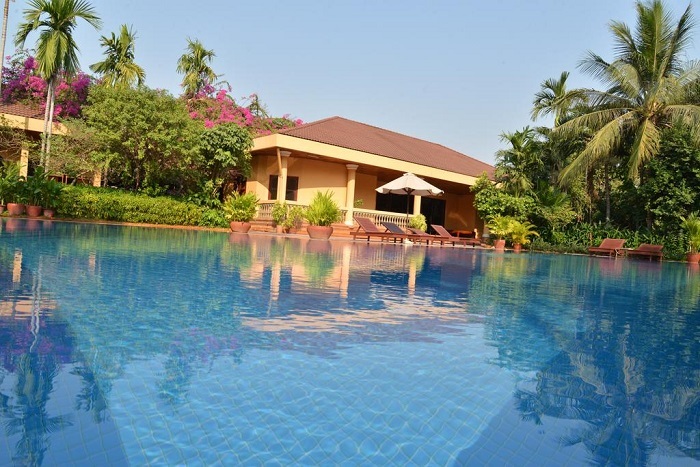 It takes only 10 minutes to walk from Siem Reap city and then you arrive at La Niche D’Angkor Boutique Hotel. Find it hidden in the nature surroundings, especially when the hotel owns an open outdoor pool and a beautiful garden once you step inside. Every room likes to boast the classic Cambodian art decoration and provide WiFi without charge. Besides, if you’re a shopping enthusiast, there are a bunch of restaurants and stores around, which only take you about 5 minutes away from the Pub Street just on foot. 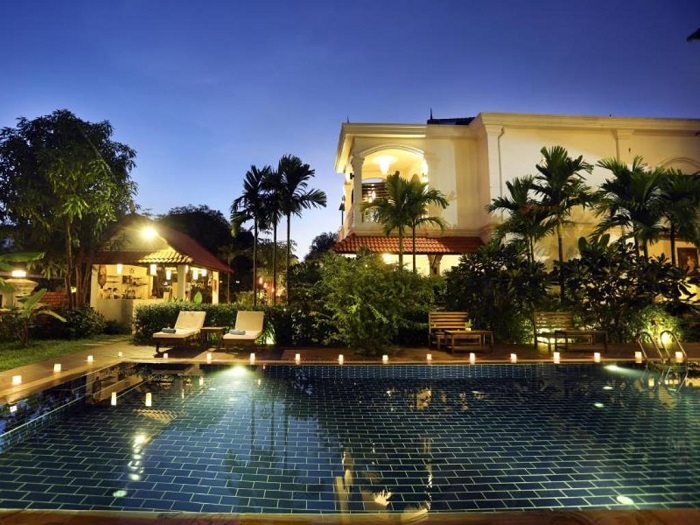 What’s else you can’t look away from this best place to stay in Siem Reap Cambodia? Guest can relax with a high-quality massage service or if you like, go to rent a bike for the surrounding exploration. Or when anyone in your group feels hungry, get back to the hotel and enjoy a traditional Cambodian cuisine and specialty dishes. Each hotel has the tuk-tuk service waiting to serve you and other travelers coming from different parts of the world. Or if you don’t like it, feel free to take a taxi, instead. Find the taxi office at the airport at the average charge of $15 when you go around the city. And it usually takes about 10 or 30 minutes to arrive at hotels from here. 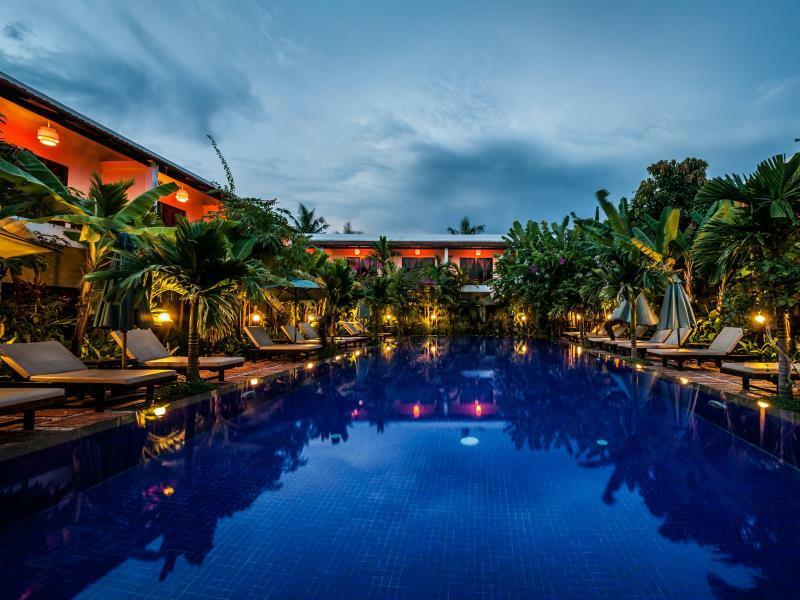 It’s hard to tell you which one is the best place to stay in Siem Reap Cambodia from our top picks in this article; because it mostly depends on your budget. Aside from this, it’s essential to know how long you would be staying here and the real purpose for your travel: relaxation or business. Getting to the hotels by Tuk Tuks is always the easiest thing to do if you want to get around the area. 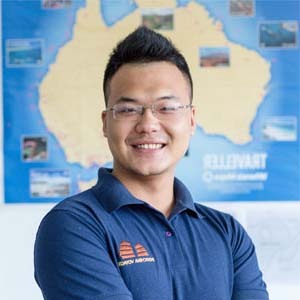 Last but not least, if you’d like to feel free enjoying every moment of your Siem Reap tour, you should have a look at some Siem Reap tour packages and ask your travel consultant to arrange your accommodation as well as transportation for you.